I recently detailed a cross-country trip that opened my eyes to how difficult it is to travel and be environmentally-friendly. Two weeks later, armed with more knowledge and reusable products, my wife and I are traveling again. This time, our destination is Victoria, BC, which is 6-hour drive/ferry combo from our home. This is my account of trying to avoid single-use plastics, recycle, and generally not add to the trashing of our planet. Warning: it isn’t always pretty. We left home bright and early with our refillable coffee mugs topped off with our own home-brewed coffee (not Keurig — gave up that waste 2 years ago!). In the car we are equipped with glass straws, hard plastic outdoor plates, camping utensils, reusable cold-beverage cups, a reusable container for left-overs and a variety of reusable cloth bags. All set! Four hours later, we arrive at the ferry terminal, park in our loading lane, and rush over to a nearby shopping area to find some lunch. Having 35 minutes before we need to be back at our car, we quickly order a sandwich to share. We’ll eat in so there’s no need to create waste boxing it up. The waiter brings us water with straws already in the glasses. Damn! I forgot to ask for “no straws, please.” Our first stop on the trip and I have already failed in my mission to avoid single-use plastics. Tick, tick, tick. The meal is taking forever to arrive. We have 10 minutes left and no lunch, yet. I ask the waiter to please make our order to go and I grab a few napkins so we can eat in the car. I don’t feel great about not using my own cloth napkins like we do at home, but paper napkins are at least biodegradable. The container our food arrives in is cardboard. It’s better than the alternatives of Styrofoam or plastic, but it still can’t be recycled due to food contamination and the thin plastic layer that most people believe is wax. It’s not. Once on the ferry, we decide a small treat is in order. M&M’s are our favorite plane, train and ferry treat. Sadly, like most candy wrappers, the delicious chocolate delights are contained in plastic. Guilt washes over me, and not just because of the extra calories and sugar I am contemplating. Purchasing them means tossing plastic into the garbage where it will forever exist in a landfill. First the plastic straws and takeout container at lunch, now this. I waver slightly in my desire for M&M’s, but we have recently given up most sweets, so the temptation is too great. I purchase the candy and count this as a loss we won’t be repeating nearly as frequently as before. A couple hours later we are settling into our hotel room. I am pleased to find user-friendly recycling bins, bulk shower gel, shampoo and conditioner, and various signs about how we can be earth-friendly during our stay. I call the front desk to ask about the type of plates and utensils they have at their breakfast buffet. I explain I travel with my own reusables and want to know if I should bring them with me in the morning. I am pleased to find out they use washable plates, cups and utensils. Excellent! The front desk person seems to think it’s cool I travel with my own items and doesn’t treat me like an overzealous nut job. Nice! 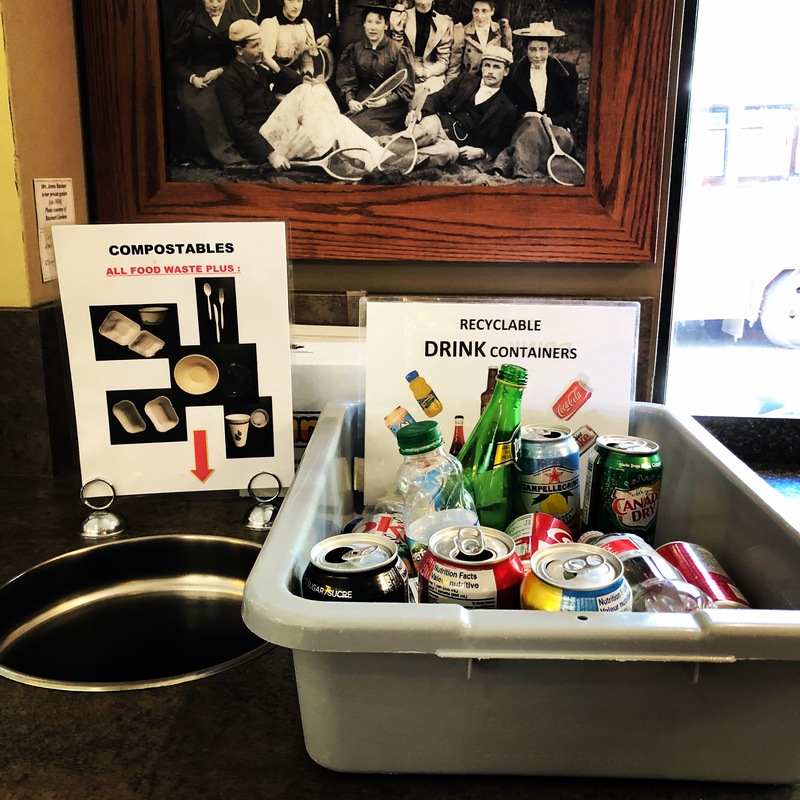 At breakfast, we find that not only are the dishes reusable, but the waste bins are labeled for recycling, composting, and garbage. Yes! Our first stop of the day is work-related. Again, we have our reusable coffee cups, filled at the hotel, so we don’t run into any issues until lunch. At that time, we are presented with a plate piled high with unwrapped sandwiches, paper napkins, no plates — so far, so good. There are a few mini-cans of Coke, a cardboard carton of coffee with disposable cups and many plastic bottles of water. Wah, wah, wah….the sound of a loss. This is a brand new facility still under construction — literally. We can sometimes barely hear each other over the sounds of metal crashing against cement, hammering and yelling. I understand the need for convenience and hope that in the future there will be real cups, glasses and pitchers of water. I could go out to the car and get my own cup to fill at the sink. It is a bit of a challenge navigating the construction zone, so going outside is not as easy as it sounds. I opt for a mini-Coke, having already spotted a box being used for recycling cans and bottles. Being cold, I later completely cave and get a cup of coffee in a cardboard cup, knowing it can’t be recycled due to the thin plastic layer effectively moisture-proofing it. Mentally, I hang my head in shame. I know I should have gone out to the car to get both my water and coffee cups. Water would have been a better choice for my body and the environment. It wouldn’t have been that difficult. The construction zone maze was just an excuse. I I feel bad that I did not show a greater commitment to the environment and my own personal values. In the grand scheme of things, it was only a coffee cup and a small can, but little things really do add up. It is possible my own commitment would have allowed me a chance to have a conversation with someone who might then start making his or her own small changes. I vow to do better next time. Over the next few days of our trip, I was very impressed with Victoria’s commitment to recycling and composting. I heard from a local that they are finding new ways to use the recycled materials all the time. I even ran into a local artist who uses recycled glass to make beautiful bowls and jewelry. How wonderful to see such commitment! On our last day, as I was soaking in the sun on a beautiful outdoor patio, surrounded with hanging flower baskets bursting with color, I hopped onto Facebook to post a photo of my amazing location. As I was playing around on my phone I found out that the restaurant across the street and all of its sister locations were going “straw free.” Wonderful news! This was the first time I ever saw a restaurant that I had been to making such a commitment. Then my delicious-looking adult lemonade arrived — with a plastic straw in it. Sigh. The problem of plastics is some pretty heavy stuff. How about treating yourself to some play? Stuart Brown, MD, founder of the National Institute for Play, teaches that play is as important to humans as vitamins or sleep. In light of this, please accept my Endangered Species Superheroes Activity Book as a gift for your health. It is 20+ pages of fun for all ages — earth-friendly word searches, fill-in-the-blank games, coloring pages and more, all featuring characters from my upcoming graphic novel. Click now to receive your gift. I originally posted this on Medium.com. If you would like to read more of my articles, please click here.